I nearly didn’t go to Fulham as I’d had a busy week. I’m moving to a new home this week and helping to arrange an AGM the following week. I’m so glad that I did go because the break from ordinary life was just what I needed. I like Craven Cottage and walking along the river from Putney Bridge to the ground has to be one of the most scenic approaches to a football ground in this country. It was a good game and entertaining to the end. I like to take a picture of the scoreboard showing the final score so took a picture of it displaying 1-4 during the four minutes of time added on. I was irritated that I had to take another one showing 2-4 but delighted to see Viv Solomon Otabor’s first Blues goal that necessitated a picture showing the final score 2-5. The happy, bouncing Birmingham City fans made the stand vibrate and I belonged to that community although I wasn’t bouncing or inebriated. I belonged there just as much as I belong in my church and in the reading groups I attend. Being at a game is a totally different experience to watching on TV. I enjoyed watching Salford City play Notts County on TV but my enjoyment was meagre compared to the elation of the Salford fans who saw their team win a place in the second round of the FA Cup. I was an observer but the fans at the game were participants and their presence there was as essential as the players being on the pitch. 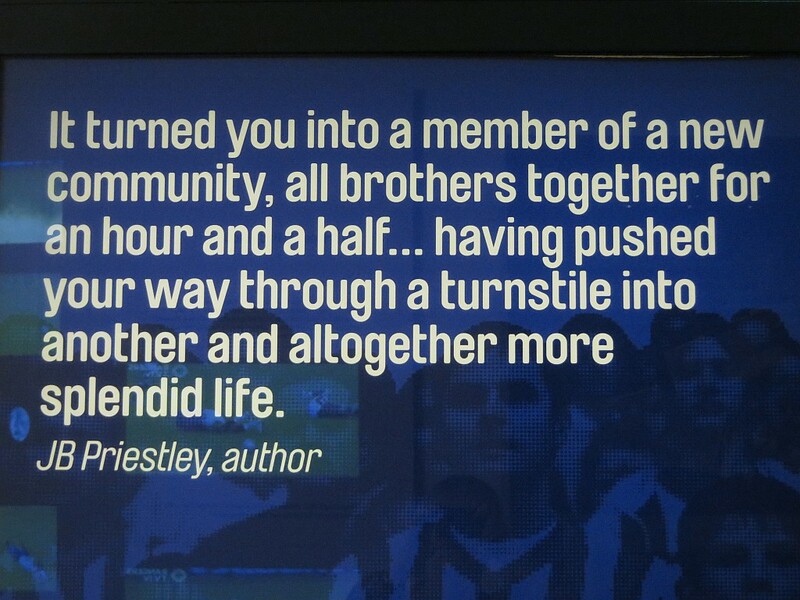 I first found the quote from The Good Companions by J B Priestly at the National Football Museum (well worth a visit if you are in Manchester) and the following longer quote on The Educated Left Foot. Lovely to read your articulate piece. I saw last year’s 1-1 draw at craven Cottage when our first half performance should really have won us the game. Then too our noisy fans bouncing on the wooden floorboards effectively silenced the home support. Excellent and most readable piece. You have eloquently demonstrated that there is so much more to football than just the spectacle of the game itself. I enjoyed the read Margaret; keep them coming!